During the luncheon, the top five time contributors were recognized along those with that assisted in creating tray favours and those that sewed wheel chairs bags for patients to store their belongings in when travelling within the hospital. The Catholic Health International Volunteer of the Year Award, which recognizes the tremendous dedication of an individual who demonstrates commitment to Hotel Dieu Shaver, was awarded to Paul Nestor, a former patient. Paul has devoted his time to the hospital’s Carpentry Shop since 2015. Paul was in a severe car accident which left him needing extensive rehabilitation. 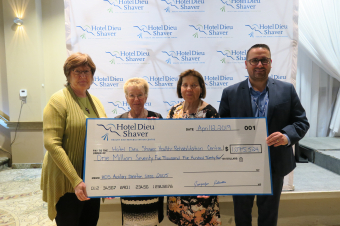 The hospital’s Auxiliary was pleased to announce their 2018-2019 contributions of $87,400. Funds raised were done so by sales in the hospital’s coffee shop and gift shop, lottery booth, bingo and 50/50 draws throughout the year. The volunteers contributed 11,209 hours in total, which equates to 5.75 full-time equivalents. Their donation allowed the hospital to purchase specialty air mattresses for wound care, patient beds, patient lifts, and a stair climber.